Description: Russell Peters Live Standup Comedy Show (February 02nd thru February 04th) . Russell Peters comes to Louisville, as he works out new material for his RUSS 2012 World Tour. You've seen him on The Green Card Tour LIVE from the O2 Arena on Showtime and Red, White and Brown on Comedy Central; now watch Russell up-close and personal as he builds his new act and works his trademark, lightning-fast improv skills with the audience. Listed on the Forbes List as one of the top ten Highest Earning Comics in the U.S. in 2009 and 2010, Russell Peters has spent the past 22 years building a career to become one of the biggest comics in the world. Thanks to YouTube and a global following, Peters has sold-out arenas from Madison Square Garden to the Sydney Opera House to London's O2 Arena, where he set a new attendance record with over 16,000 fans in attendance at his February 2008 show. Peters has also performed for the troops in Afghanistan, Iraq and on the USS Eisenhower and appeared on The Tonight Show with Jay Leno, Lopez Tonight, Jimmy Kimmel Live, The Late Late Show with Craig Ferguson and HBO, CNN, MTV and the BBC. Showtime and Comedy Central The Green Card Tour LIVE From the O2 Arena "Lopez Tonight"
Description: Get Ready for some "Rolla Ruppa" and loads of music, masti and punjabi food including saag makki ki roti. Spring time is just around the corner, and to celebrate the auspicious festival of Baisakhi, PCS is organizing "Baisakhi Mela". This time again the venue is Multipurpose Room of Student Activity Center at UofL, and the day is Saturday, April 28, 2012. Please mark your calendar and stay tuned for more details!!! 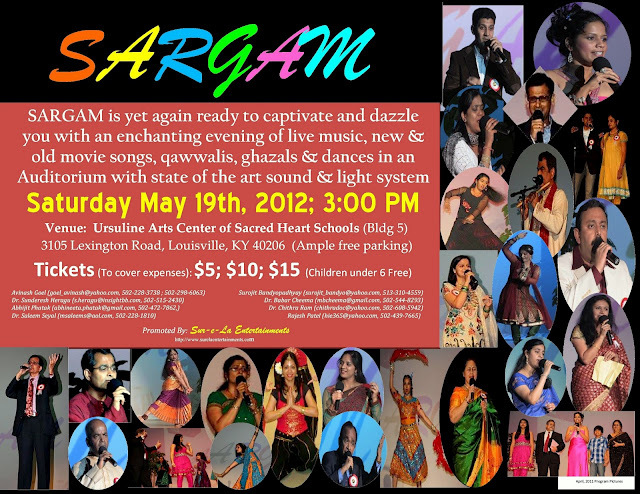 Description: Sargam is yet again ready to captivate and dazzle you with an enchanting evening of live music, new and old movie songs, qawwalis, ghazals and dances in an auditorium with state of the art sound and light system. The ICF board will hold the 2012 Annual General Body Meeting of all its board members on the 15th of December at the Ramada Inn (1041 Zorn Avenue, Louisville, KY) from 2:00 pm to 3:00 pm. All ICF members are invited to attend this meeting.